The University of Melbourne’s Arts and Science degrees are the most popular courses in Victoria, according to the Victorian Tertiary Admissions Centre’s first preference applications 2019. The University of Melbourne’s Arts and Science degrees are the most popular courses in Victoria, according to the Victorian Tertiary Admissions Centre’s (VTAC) first preference applications for study in 2019. Four courses at the University of Melbourne – Arts, Science, Commerce and Biomedicine – are ranked in the top five most popular courses in Victoria. This afternoon VTAC released first round undergraduate offers, with 51 638 first year students receiving an offer of place at a Victorian university this year. The University of Melbourne offered places to 7397 students, including 1859 students who received offers for the Bachelor of Science and 1841 for the Bachelor of Arts. The five largest undergraduate degrees – Science, Arts, Commerce, Biomedicine and Design – all received applications from students with ATARs of 99.9 or higher. University of Melbourne Deputy Vice Chancellor (Academic and Undergraduate) Richard James said the University had attracted many high achieving students from diverse backgrounds. “We’re delighted that so many talented students from all walks of life want to come and be part of what the University offers, a vibrant and stimulating environment that prepares leaders of the future,” Professor James said. “The University of Melbourne offers outstanding teaching for students at our main Parkville campus and at our other locations around Victoria. “The high number of students undertaking higher education studies this year shows that school leavers and the broader community continue to see the benefit of a university degree to enhance their career prospects and be more attractive to employers. Melbourne Chancellor’s Scholarships are awarded to students who achieved an ATAR or equivalent of 99.9 or above. These scholarships attract some of the most academically able students to the University of Melbourne. Each Chancellor’s Scholar receives a fee exemption, living allowance and a guaranteed place in the graduate program of their choice. “This year 16 Indigenous students with ATARS over 90 have been offered a course with a Melbourne Chancellor’s Scholarship, while the highest number of Indigenous students ever, 85, have been offered places,” Professor James said. For the first time, students have been offered the opportunity to enrol in Graduate Degree Packages, a new suite of degrees offering guaranteed pathways to a range of professional masters degrees including architecture, construction management, dental surgery, engineering, landscape architecture, law, optometry, physiotherapy, property, teaching, urban planning and veterinary medicine. Professor James said it was gratifying so many students are opting to pursue engineering pathways, with 321 offers being made for engineering Graduate Degree Packages. 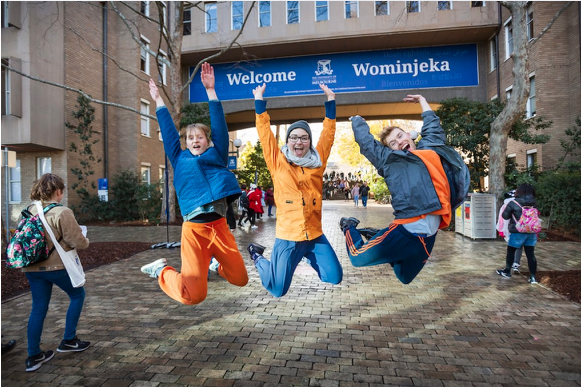 The University’s thriving Access Melbourne equity program increased its offers from 2350 last year to 2461 this year, comprising 33 per cent of all University of Melbourne offers for 2019. “Access Melbourne ensures that more students from rural and disadvantaged backgrounds can attend the University,” Professor James said. Professor James reminded students still looking to secure course entry that second round offers are now open and provide an opportunity to change preferences and attain their preferred degree.